Kathleen and I go to the New Braunfels farmer's market nearly every Saturday morning. The produce is delicious, it's grown organically on local farms, and the vendors are people we know. There's always live music and a big crowd. If you want the best greens and tomatoes, you gotta get there early. And do you remember the children's book by Dr. Seuss called Green Eggs and Ham? You can buy green eggs at this market. On a recent visit, Kathleen and I were walking from the parking lot to the stalls when Kathleen started laughing. She whipped out her camera and took this picture. I wasn't laughing. I first heard about the Rapture in 1973, when I was a much younger man. I was an Army captain and had recently survived a combat tour in Vietnam and two intense years at the Duke University Graduate School. With my degree in hand, I had arrived at West Point for a new assignment as an English professor. Quite a few of my West Point class of 1967 buddies were there to join other departments, so one evening we assembled at one of their homes for drinks. Most of my friends were talking excitedly about the Rapture. I was surprised at how many of my classmates and their wives had read the Hal Lindsey bestseller, The Late, Great Planet Earth (1970), and had passionately embraced the idea. I was a Christian myself, but I hadn't read the book and I hadn't heard about the Rapture. I remember how incredible it sounded to me. The end times were near, and one day all the faithful would be swept up en masse - physically - into heaven, while everyone else would be left behind wondering where they all went. The believers would be safe with Jesus, and the nonbelievers would perish in the apocalypse. My friends, who cared about me, didn't want me to be left behind. This was nearly 40 years ago. In a later book, The 1980s: Countdown to Armageddon, Lindsey prophesied that "the decade of the 1980s could very well be the last decade of history as we know it." No, none of my friends were raptured. 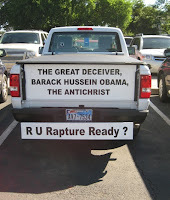 I sometimes wonder how long they continued to believe in it, or if any of them still do - like our guy with the zany pickup truck at the farmer's market . Because apparently the Rapture is still a very big deal, or at least big business. Hal Lindsay's 1970 book sold over 20 million copies. He's still alive and prophesying and receiving royalty checks from it. In 1995 the first of the Left Behind series of 15 novels was published. These later became the basis for a series of popular movies and video games. End-of-the-world predictions have proven false countless times, but there seems to be a never-ending market for more. The Jehovah's Witnesses predicted the end in 1914, 1918, 1925 and 1942. Chuck Smith predicted Jesus would return in 1981. 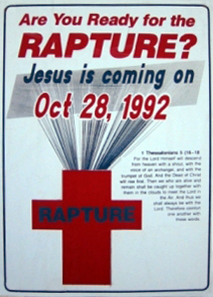 A Korean sect called "Mission for the Coming Days" predicted that the Rapture would happen on October 28, 1992. Edgar Whisenant predicted the end in 1989, then 1992, then 1995, and again later. John Hinkle of Christ Church in Los Angeles predicted that the end would come on June 9, 1994. Radio evangelist Harold Camping set the end-date for September 6, 1994. When that didn't happen, he revised the date for May 21, 2011. Hey, wait a minute...that was yesterday! 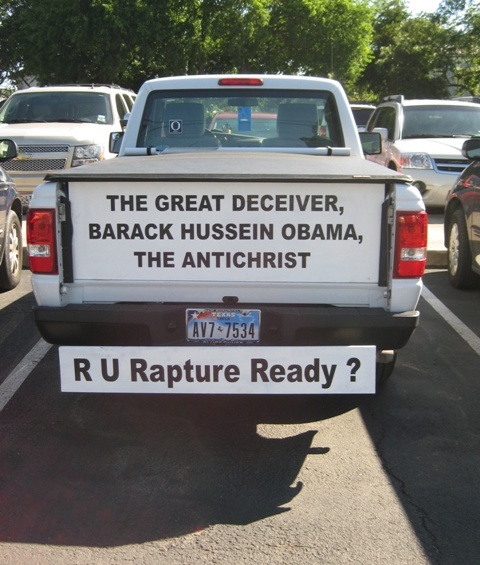 AP writer Garance Burke's Internet article, "Apocalyse believers await end, skeptics carry on," relates the experiences of Christians lured to California for the latest Rapture event, which didn't happen. What are the chances that Harold Camping will revise his prediction again? Or that believers will be taken in again? I would say the chances are high. According to the article, Camping's IRS filing reveals that his "Family Radio" enterprise received $18.3 million in donations in 2009 and had $104 million in assets, including $34 million in securities. I've come to accept that this is the way the world works, at least in my lifetime. I have a deep respect for the human need for hope and faith and for the role the world's religions play in satisfying this need. But I'm always surprised at the strangeness of some of the beliefs, and how reluctant people in general are face up to hard truths. Camping's formula is simplistic. The notion (nailing the day) is presumptuous. The baggage (trinity and hellfire) is typical. And he sure has flummoxed a lot of followers. But he is 'keeping on the watch.' No one can say he's not doing that. As so many before him have done, like you pointed out. One of the problems with religious zealots is that they don't read their own holy texts. For example Matthew 24:36 - "No one knows about that day or hour, not even the angels in heaven, nor the Son, but only the Father." Hey, if not even Jesus knows the date, then why would some guy with a radio show be any better? Thank Kathleen for the picture for me. Laugh. Camping already revised to a date in October, I heard. I WANT TO BE LEFT BEHIND. All my friends will still be here. What is the hard truth? Jesters telling the truth for profit makes it no lie. What would you say if I said Mr. Camping was correct in saying May 21, 2011 was the official day of judgment.? No it was not the rapture or the return of Christ but still Judgment Day. Everyone thought Judgment Day was the last day but it is not. Fact is judgment began in the year 1988 when God’s judgment came upon all the local churches. If I was right, you would probable have to quote 2 Peter 3:4 saying, Where is the promise of his coming? for since the fathers fell asleep, all things continue as [they were] from the beginning of the creation. Attempting to say I was wrong. But the heavens and the earth are unto fire against the day of judgment and perdition of ungodly men. The fact that Hal Lindsey has "pointed" a specific date for RAPTURE and "failed" DOESN'T MEAN that RAPTURE will not become reality. The Bible itself mention that NO ONE KNOWS, even The Army of Heaven. Sorry for my 'weak' english speaking (I'm from Brasil). Hey Denny, I just learned that you were a christian by the time you first heard about the Rapture. I wonder if you still are. And I would like to say that the Rapture is a Bible prophecy that was made before anybody of those whose failed prophecies you mentioned. The Rapture is yet to come, even though this statement is not for everybody but only those who believe the Bible. We cannot ridicule the Rapture because someone ventured to set a date. Let us rather take the Bible and see if it is being proven wrong, than some people's failed predictions.